Ronda is a town in Spain which is located in the mountains with an altitude of 750 masl. Located approximately 591 km from Madrid. Located in the west of the province of Malaga, the town is one of the oldest cities in Spain. Ronda town has existed since the 18th century. Andalusia remains of buildings can be found here. The city is divided into two, namely the old town and modern. Both are separated by a chasm as deep as 100 meters called El Tajo. If you came to this city, you will see many buildings and residential areas on the brink. Not only that, the city of Ronda will also spoil you with beautiful mountain views. Suitable for lovers of animals and plants because the city is rich in ecosystems. To reach the city of El Tajo separate, visitors can go through the bridge as high as 98 meters. The bridge was built using stones from the River Tangus, adding to the impression of an antique. That said, this bridge has been built since the triumph of the Romans. Differences that separate the city is clearly visible from the building, which one looks modern and others look old. 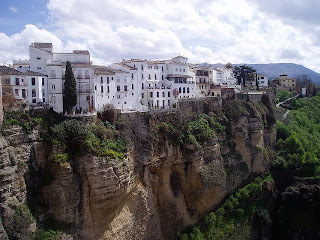 Town of Ronda is the remains of the kingdom of Andalusia. This can be seen from the Church of St. Mary, a place of worship Ronda residents are mostly Catholic. This church was once a mosque, can be seen from the decorations on the walls and gates are still original. Adds a classic in this building. Besides the church, examples of old buildings can be visited at the Plaza de Toros Ronda is. Plaza de Toros is the oldest bull ring in Spain that is still standing strong. First, the plaza de Toros de Ronda is used to hold a bullfighting match. Now, the Plaza de Toros used as the most popular tourist attractions in Ronda. This arena has a diameter of 66 meters, complete with bleachers five rows. 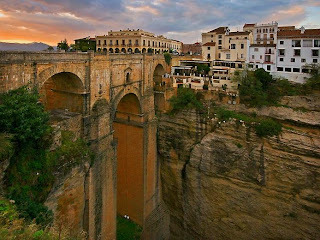 `City of Ronda is suitable for you lovers of history.